Spikes Asia, the leading creativity festival in Asia, kicks off this week at Suntec Singapore. From September 27 to 29, the Cannes Lions-run creativity festival (which saw over 1,800 delegates in 2016) will play host to seminars from the region’s top creative thinkers and innovators, culminating in the Spikes Asia Award Show, the region’s most prestigious awards for creative communications. This year, Isobar will be hosting three on-stage sessions, covering Experiential Technology, Disruptive Innovation and Diversity in Talent. Singapore’s Stan Lim, Regional Creative Director and Chye Yong Hock, Innovation Director, will be discussing how ‘Experiential Tech Will Lead The Way For Compelling Brand Experiences’. Meanwhile, Sandipan Roy, APAC’s Chief Strategy Officer, will be presenting ‘Why Innovation is a Crapshoot and a Reason for Global Stagnation’, followed by Gianni Gurnani / Gigi Giubilee, Creative Director at Isobar Hong Kong, with an inspiring Masters of Creativity session on ‘Culture Misfit — A Drag Queen’s Take on Talent’. In Stan & Chye’s session, the pair will demonstrate how to think deeper with experiential tech, including AR, VR, AI and voice. They will also share creative applications within the retail, government, healthcare and education sectors, drawing from their experience in building a solution for General Motors, currently in use at 110 GM dealerships in Korea and a first for the automotive industry in Asia. For the first of Isobar’s Thursday sessions, Sandipan will explore how businesses and brands can increase the predictability of ROI from innovation initiatives, and will offer a glimpse into the Why’s, What’s and How innovation can be made more rewarding without sacrificing the unpredictability of the outcome. Isobar’s third and final session sees Gianni, a creative director by day, and drag queen performer at night, take the stage. Gigi as he is known on stage, will discuss what is truly blocking increased diversity in creative departments, and will share tips on how to remove the unconscious bias lens and appreciate brilliant creatives for who they are. In addition to Isobar’s on stage presence at Spikes Asia this year, Dinh Quoc Viet and Tran Duc Tien will be representing Isobar Vietnam in the Young Spikes Integrated Competition, having won the national-level competition in Vietnam. The two-day challenge will see the duo create a winning integrated campaign, in response to a brief set by a charity or non-profit organisation. The Gold winning team will receive their medals at the official Spikes Asia Award Show, as well as full delegate passes to next year’s edition of Spikes Asia. This year, Isobar was also invited by Spikes Asia to design a call-to-action ad that would run in Campaign Asia magazine. Internally, a competition was held amongst Isobar’s promising young creatives to design the ad that would be presented to Spikes. The winning duo from Dentsu Isobar Japan, Yuko Uesu and Tetsuya Mehara designed the ad below that ran in print and received passes to attend the festival as well. 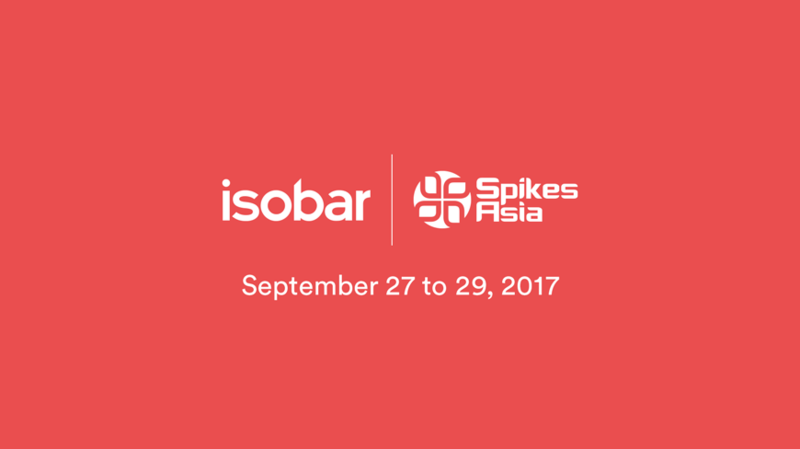 Keep up to date with Isobar’s activity at Spikes Asia by following @Isobar on Twitter.